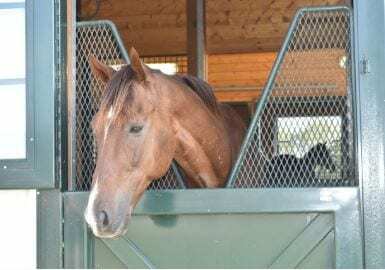 The debate to keep horses in stalls or let them live outside is a fierce one among horse owners and caretakers. While many studies show the health benefits of keeping horses on grass as much as possible (increased joint and digestive health being two main points), there are some potential issues with this lifestyle, including the possibility for metabolic troubles from too much grass. It has been shown that most horses would prefer to be outside, with access to shelter, the majority of the time—even when it's cold outside and humans are reaching for sweaters and coats. Read more at the Naturally Healthy Horse. This entry was posted in Horse Care, NL List and tagged cartilage, horse care, pasture, recover, rehabilitation, stall, stereotypy, stress, stunt, sugar, ventilation, weather by Paulick Report Staff. Bookmark the permalink.